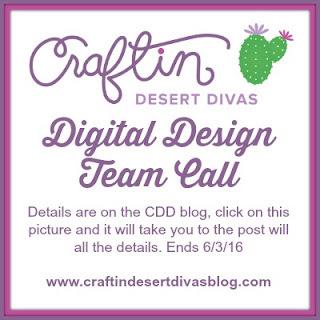 We are looking for a few dependable crafters who love to color digital stamps and share their projects they create. This is for the term July-Dec 2016. You will create at least 2 projects per month. One will be to inspire others to join in our digi challenge that is posted in the CDD Gallery group on Facebook. The second is a project of your choice. You projects must be well photographed. No distractions in the background. Bright projects showcasing the CDD digi images are a must. We ask that you comment and be active in the CDD gallery. We also ask that you share your projects on social media such as Facebook, Facebook groups, Blog, Instagram etc You don't need a blog, but sharing is a must. You can be on other teams. We offer free digi stamps, free SVG's, discount to the CDD Shop. You will also be listed on the CDD Blog and CDD Shop design team profiles. If this sounds like something you'd be interested in we'd love to hear from you! 1. Choose 4 of your favorite projects. They can be projects you've created in the past or new ones you make just for this DT Call. Be sure you include projects that show off a range of your talents, including your use of digi stamps, including any coloring techniques you use. Image coloring and coloring and stamping are a must. I sent my application email in. I have my fingers and toes crossed.